Woman gives birth at 70 — isn’t that ridiculous? Or worse, isn’t it unethical, to bear kids you might not be around to see into adulthood? Those aren’t my questions — they’re the undertow in all the reporting on the latest installment in the “how late can you wait” fertility story. This time the new record comes from India where the 70-year-old Rajo Devi finally fulfilled her life-long quest for a baby, via egg donation. (But wait — didn’t Omkari Panwar give birth at 70 in India — to twins — this June?) Last year the story came from New Jersey, when psychologist Frieda Birnbaum, already the mother of two adult children and a first-grader, became at 60 the oldest woman to have twins in the US (there seem to be no end of record-setting opportunities). What’s going on is revolutionary. The so-far only occasional 60- and 70-year-old mothers get headlines, but the hundreds of thousands of women starting or continuing their families in their late 30s and their 40s, and the increasing numbers having kids in their 50s are the big change agents, redefining women’s roles in every respect. It wasn’t long ago that they too were facing questions about their suitability as parents — wouldn’t they be too worn out and out of touch with the youth culture? But kids are a fitness program in themselves, parents who start later make the extra effort to keep up, and it turns out that older parents offer special benefits, both to their kids and to the world. Newly supplied post-1960 with birth control, longer life expectancies, expanded adoption options, and more recently with IVF and egg donation technology, women as a group have been rewriting our life plots, answering Freud’s question “what do women want?” by example. It turns out that many of us want families, but we also want careers and a say in the way the world is run. 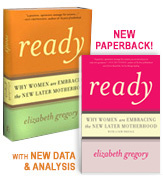 Delaying kids makes it possible for women to have all three, for the first time in history. That’s not the story we tend to hear however. Instead, we get lots of admonitions – either about waiting “too late” to have kids the usual way, or about succeeding “too late” to do the motherhood job well. But though the many media stories about infertility might give you the impression that nobody over 35 can have kids the standard way, many do. Where in 1970 only 1 in 100 women started their families at or after 35, in 2006 it was 1 in 12. And 1 in 7 babies overall were born to moms 35 or more (611,000 in 2006, of which roughly 6,000 involved egg donation). Add in the adoptive moms and that’s quite a crowd of later moms. Which isn’t to say that there are no problems. While about 11% of women are infertile at 35, it’s about 50% at 41, and after 43 very few women can have kids the usual way. Egg donation is an option for those who can afford it – chances are 50/50 at every attempt. Adoption is an option too, with its own complexities. So why do women wait? In interviews, later moms give four basic reasons: education, establishing at work, finding the right partner and self-development. Many cite all four. It turns out that delaying kids has served women as a shadow benefits system, linking to higher lifetime salaries (delay can be a class elevator, and one study shows a 3% annual return to delay in lifetime earnings) and the clout to demand flexible schedules when they’re not offered to less experienced workers. As women trickle up into policy-making roles, family friendliness spreads. Maybe soon women who feel ready to start earlier won’t have to choose between having kids and earning a decent wage. In addition, delay leads to greater equality in marital decision-making, a phenomenon that transforms the family dynamic and raises the happiness level of all involved. Amazingly but handily, later moms live longer (partly a physical issue and partly one of health-care access linked to their higher incomes). There’s a new twist on the “how-late” contest. Of course, the demand to expand the fertility window pushes scientific innovation, and we can expect ongoing breakthroughs in that realm. But perhaps most importantly, later moms are the agents of enormous social change, because their business savvyness and credentials are getting family and women’s issues a hearing they’ve never had before, and moving us toward a culture of care and fairness. It turns out that many individual women’s personal choices add up to good effects for the group. Which brings us back to the 60- and 70-year-old moms. Rajo Devi made her choice in circumstances quite different from Frieda Birnbaum’s, to escape the negativity she’s lived with as a “barren” woman in a culture where female fertility is highly valued. Relatedly, Omkari Panwar, the mother of two grown girls, sought out IVF at 70 in order to have a son in a world where boys are preeminent. Both women have extended families who will care for the kids if they cannot. Their choices might not be yours, but apparently they make empowering sense to these ladies. Birnbaum operates in a different but related world in which she and her husband expect to live long in good health and choose to spend their later years actively parenting young children. Sounds neither ridiculous nor unethical, but it does sound new. All these women are exercising choice, which in itself may be what shocks the naysayers. It’s a new world when women can write their own life stories, and as they do they further change the world for everybody. For millennia, mothers have been strategizers, making good choices for their families and themselves in whatever circumstances, based on the available information, and building upon one another’s experience. Instead of admonishing mothers for not doing the familiar, it’s time to listen and learn. In this season of innovation around standard maternity, we can celebrate and support the familial, in all its forms.